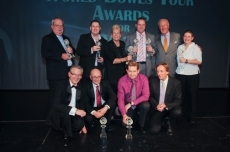 Henselite UK sponsored player Paul Foster grabbed a hat-rick of awards at the recent World Bowls Tour Annual Awards Ceremony on the eve of the World Indoor Championships at Potters Leisure Resort. A delighted Foster collected the Player of the Year, Shot of the Year and the Players Player of the Year. Fellow Henselite UK player Greg Harlow collected the Fans Player of the Year award.